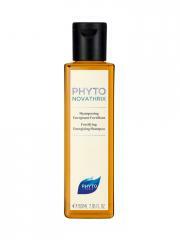 Phyto Novathrix Fortifying Energizing Shampoo 200ml is an energizing fortifying shampoo that acts against hair loss of all types. As the best supplement to Phyto Novathrix anti hair loss treatment, this shampoo is enriched with guarana extract, an energizing active ingredient that restores strength and vigor to the hair. Its red alga extract with sheathing properties wraps around the fiber for visibly thicker hair. The horsetail extraction completes the formula. Results: The hair is stronger, more beautiful and shinier. Apply on the wet scalp, massage gently, leave on for 2 minutes then rinse. Indication: Energizing fortifying shampoo to act against hair loss. Aqua (Water), Cocamidopropyl Betaine, Sodium Lauroyl Sarcosinate, Disodium Cocamphodiacetate, Peg-200 Hydrogenated Glyceryl Palmate, Sodium Chloride, Lauryl Pyrrolidone, Phenoxyethanol, Peg-7 Glyceryl Cocoate, Polyquaternium-22, Parfum (Fragrance), Glycerin, Coco-Glucoside, Glyceryl Oleate, Coconut Acid, Citric Acid, Tetrasodium Edta, Hydrolyzed Rhodophyceae Extract, Equisetum Arvense Extract, Sodium Benzoate, Paullinia Cupana Fruit Extract, Potassium Sorbate, Tocopherol, Hydrogenated Palm Glycerides Citrate, Lecithin, Ascorbyl Palmitate Limonene. Origine Végétale et naturelle/Botanical and natural origin.